Today I made some time to stamp with the Secret Garden stamp set and use the coordinating Secret Garden Framelits. I stamped the floral image in Pacific Point ink on Tangerine Tango card stock and then cut it out using the coordinating Framelit. I stamped the image again on Pool Party card stock, cut out the center of the flower, added a Designer Printed Brad to the middle, and attached it to the Tangerine Tango flower with a dimensional. I finished the flower with some leaves, a butterfly and two pearls. I cut out two frames using the Labels Collection Framelits--one in Whisper White and the other in Pacific Point. I sponged Pacific Point ink around the edges of the Whisper White layer. It's difficult to see in the photo, but I used the Festive Paper-piercing Pack to pierce holes all around the edge of the Pacific Point layer. For the inside of the card, I added the same piece of International Bazaar DSP that I used for the front. I stamped another flower from the Secret Garden stamp set in Pacific Point ink on Whisper White card stock and then cut it out using the coordinating Framelit. I finished it with a few leaves (from the Secret Garden Framelit set) and a piece of ribbon. That's it! Stampin' Up! has just released their list of retiring stamp sets and accessories. Some of the Retiring Accessories are listed at 25%-60% off! If there's an "X" in the far right column on the Retiring Accessories list, that means supplies are gone. I will be updating the Retiring Accessories list often so it will be current with what has already sold out. Place your order today before these items are gone for good! Remember, the retiring accessories are available only while supplies last! I'm so happy to be participating in this month's Control Freak Blog Hop. If you're following along the tour, you should have just come from Cindy Elam's blog. If this is your first stop, be sure to click on the "next stop" button at the bottom of this post (only after you're checked out my projects of course!). It will take you from blog to blog until you circle back around here again. The theme for this month's hop is birthdays. The main inspiration for my projects was this cute little sticky note pad that I bought the other day. I thought it would make a cute gift to put in a birthday party goody bag. For the base I took a piece of Twitterpated DSP and glued it to a blank coaster. I sanded the edges to give it a nice finish and then adhered the sticky note pad in place. The binder clip at the top serves two functions--it allows me to add more embellishments to the project and it's also a pen holder. I covered the binder clip in another piece of Twitterpated DSP, a piece of ribbon, and a stamped image of a cupcake. For my second project I wanted to make a small bag that could be used to either wrap a small gift or it could be filled and given away as a goody bag. Both the top and bottom of the bag are made from the Fancy Favor Bigz Die. I cut the base out of Island Indigo card stock and assembled it together normally. I cut the top out of a piece of Twitterpated DSP. Before I assembled it, I cut off all four of the bottom flaps (that would fold in to make the base of the box). I adhered the two sides together to form the box shape. Next I slid the DSP down over the top of the Island Indigo base (notice the scalloped, wavy edge is on the bottom of the DSP). I took a 1/4" circle punch and punched two holes in the top of the DSP, threaded some ribbon through it, and tied it in a bow. The inspiration for the decorative piece that I put on the front of the bag came from page 51 of the current Idea Book & Catalog. All of the layers are popped up on dimensionals for added depth. I cut out the "Happy Birthday" banner by hand and then added a few pieces of bling to finish it. I was so happy with how it turned out, that I decided to use it as the central image for my birthday card too. You can't celebrate a birthday without a birthday card, can you? I've never had a card come together as quickly as this one did. I already had the central image designed, so I just had to design the card base. Maybe I should try that more often! Again, I used the Twitterpated DSP for this project so that all of the projects would coordinate. Of course I had to add a little bit of DSP and a few layers to the inside of my card as well. Are you ready to see what the rest of the Control Freaks did with this theme? Then hop on over to LeeAnn Greff's blog and continue along the tour. Today I made a cute project that I think would work for Administrative Assistant's Day (next Wednesday) or for a teacher's gift. It's a note holder that holds 3 1/2" pieces of paper. The tutorial for this box came from Split Coast Stampers. I made a clear acetate lid for the box (using the measurements in the tutorial), but it's too big. You can barely see it in the photo, but it sticks out from the side of the box. I'm going to try to make another one and cut it down 1/16"-1/8" so it fits better. I used the single flower image from the Flowering Flourishes stamp set to stamp around the edges of the box as well as on the individual note papers. I finished it with some ribbon, a button, and some hemp twine. Very simple yet it turned out really cute. Thanks for stopping by! on all orders (excluding expedited shipping) placed Saturday, April 6th through Monday, April 8th. You have two days to look through your catalogs and get your orders ready. 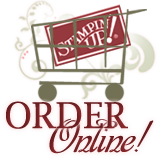 This is an offer that Stampin' Up! hasn't done in years, so take advantage of the opportunity while you can. If you don't have a current catalog, you can view them online. Place a minimum $50 order with me, and I'll send you a catalog in the mail for free! You can place an online order with me by visiting my website and clicking on the "shop now" button in the upper right hand corner. You can also email me (Dannie@DanniesDesigns.com) your order and I'd be happy to place it for you. Have fun shopping!